As the days get colder, it gets harder and harder to pull oneself out of a warm bed in the morning. But ever since I was a young Chung, I always knew I had to eat breakfast, even if I overslept and then had to frantically get myself out of the house and to school on time (most mornings, I would leave the house with socks in one hand and my breakfast in the other as Twin Sista would honk at me to get a move on). This breakfast is quick to make and it's tasty enough to pull you out of your warm bed in the morning at the thought of eating it. And I make this most mornings when I have to get up to go to work. 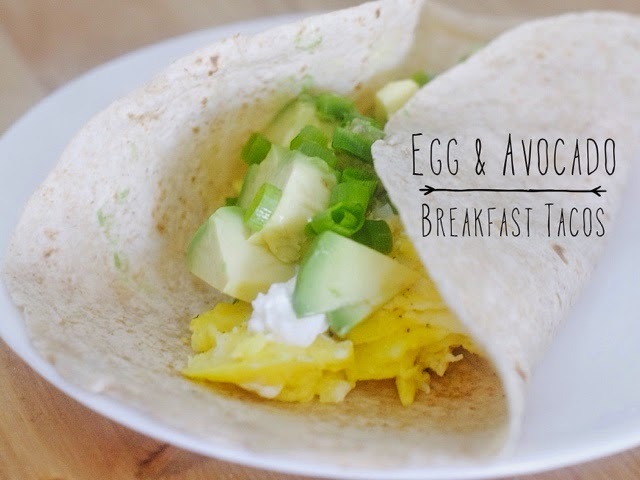 Tortillas, eggs and avocados: all of my favorites combined to make a tasty breakfast taco. 1. Heat pan over medium heat. Spray pan with cooking spray or melt a dab of butter to cover pan. Meanwhile, crack egg (or however many eggs you would like to eat in the morning) into a bowl and beat egg(s). Sprinkle a dash of garlic powder into egg and mix until incorporated. Pour egg mixture into heated pan and scramble egg until cooked through. 2. Heat another pan over medium heat. Place tortilla onto pan and heat each side for 30-60 secs. Remove from pan to start assembly of taco. 3. Place warmed tortilla onto plate and place scrambled eggs onto tortilla. Then top with avocado, green onion, Greek yogurt and a pinch of salt to taste. Make several tacos or just one if that's enough for you to eat in the morning.